The Palaeocene–Eocene Thermal Maximum1, 2 (PETM) was a global warming event that occurred about 56 million years ago, and is commonly thought to have been driven primarily by the destabilization of carbon from surface sedimentary reservoirs such as methane hydrates3. However, it remains controversial whether such reservoirs were indeed the source of the carbon that drove the warming1, 3, 4, 5. Resolving this issue is key to understanding the proximal cause of the warming, and to quantifying the roles of triggers versus feedbacks. Here we present boron isotope data—a proxy for seawater pH—that show that the ocean surface pH was persistently low during the PETM. 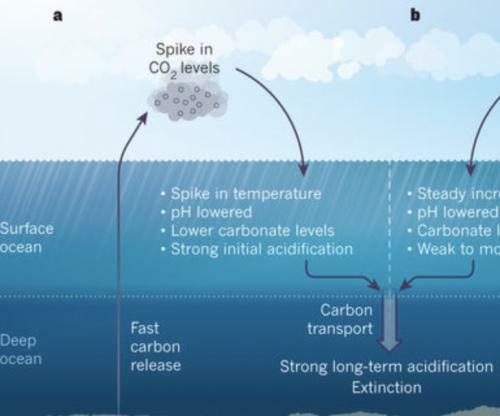 We combine our pH data with a paired carbon isotope record in an Earth system model in order to reconstruct the unfolding carbon-cycle dynamics during the event6, 7. We find strong evidence for a much larger (more than 10,000 petagrams)—and, on average, isotopically heavier—carbon source than considered previously8, 9. This leads us to identify volcanism associated with the North Atlantic Igneous Province10, 11, rather than carbon from a surface reservoir, as the main driver of the PETM. This finding implies that climate-driven amplification of organic carbon feedbacks probably played only a minor part in driving the event. However, we find that enhanced burial of organic matter seems to have been important in eventually sequestering the released carbon and accelerating the recovery of the Earth system12.